In the same vein as 1968’s classic Rosemary’s Baby, 1977’s Demon Seed offers a tale of unnatural offspring. Dr. Alex Harris (Fritz Weaver) works as a computer scientist, and his estranged wife Dr. Susan Harris (Julie Christie) enjoys a career as a child psychologist. Alex creates a home automation system that gives Susan the creeps, and she feels his innovations dehumanize Alex. This occurs even though Alex comes up with “Proteus IV”, an AI program that seems to invent a cure for a form of leukemia. Susan’s instincts prove correct when Proteus exceeds its boundaries and takes control of the Harris abode. It starts to impose its will and uses Susan as a vessel for its ambitions. As a 10-year-old in 1977, I was too young for “R”-rated fare such as Demon Seed, and I can’t claim much awareness of it after that year. To me, Seed existed as one of many 1970s movies in the same “evil kid” vein, along with flicks like The Omen and It’s Alive. 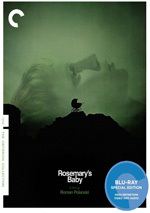 While Seed does fit that genre, it mainly hearkens back to the aforementioned Rosemary’s Baby, mainly due to the fact that it doesn’t really feature the wicked child implied. Whereas the 1970s movies offered evil shenanigans by the offspring, Baby and Seed focus more on the build-up. This becomes especially true of Seed, which proceeds more like a cautionary tale of technological overreach than a traditional “evil baby” movie. At times, it feels like an extension of the HAL-9000 scenes from 2001, though with greater terror on display. Or greater attempted terror, at least, as Seed fails to muster many actual scares. Slow and limp, the movie gets points for prescience but it rarely offers real entertainment. I do think it’s interesting to compare Proteus – and “Alfred”, the home automation system at the Harris house – with current technology. As I alluded, Seed proves to be surprisingly accurate in the ways it depicts this form of equipment – most tales of this sort seem awfully dated, but the engineering of Seed seems pretty believable compared with 2017 standards. Seed also throws in Terminator vibe with the menace presented by self-aware machines. Granted, other stories have embraced this same theme – fear of automation is nothing new – but I still think Seed creates potentially intriguing threads in that regard. Again, “potentially” turns into the operative phrase, for Seed can’t do much to deliver on its ideas. While it comes with the spine of a clever, involving tale, the end result tends to seem bland and uninspiring. Honestly, Seed would probably work better as a short film or part of an anthology. As depicted here, it lacks the substance to sustain the viewer across 95 minutes. The movie tends to drag and sputter without much dimensionality or depth. This means Seed wears out its welcome well before it ends. The story starts slowly and never gets much better, as it remains bland and without real terror. Matters get worse and worse as the film progresses, so the “climax” in which Susan deals with Proteus seems like it’ll never end. Which seems like a shame, as I do think the story comes with potential. As depicted here, though Demon Seed remains consistently mediocre. Demon Seed appears in an aspect ratio of approximately 2.40:1 on this Blu-ray Disc. The movie delivered a decent but not great image. Much of the movie showed adequate delineation but the image rarely seemed especially tight, and occasional soft shots popped up as well. I saw no jaggies or shimmering, and edge haloes remained absent. Print flaws also failed to appear. Like sharpness, colors seemed adequate but bland. The movie went with a low-key palette that lacked much pep, but the transfer replicated the tones as shpt. Blacks were a bit inky, and shadows demonstrated reasonable clarity. This was probably as good as the movie could look, but it’s still not a particularly attractive presentation. Similar thoughts greeted the wholly ordinary DTS-HD MA monaural soundtrack of Demon Seed. Not that I expected much from a mono mix created 40 years ago, of course. Speech failed to present great naturalness but the lines seemed intelligible and distinct enough. Music sounded decent, with a score that showed reasonable range. Effects didn’t have a ton to do in this fairly chatty thriller, and they seemed ordinary as well. Those elements could be a little bland and without much punch. Seed delivered a wholly average soundtrack for its era. The Blu-ray includes the film’s trailer and no other extras. Although I give Demon Seed points for technological prescience, the movie itself bores. It wastes a chilling premise to deliver a dull experience. The Blu-ray offers generally decent picture and audio but lacks notable supplements. Seed seems forgettable.